The Chaplain's Dilemma: Can pastors in the military serve God and government? Editor’s note. In response to readers’ queries about the publication of advertisements in America for military chaplaincies, the editors invited articles about pastoral ministry to U.S. troops from John J. McLain, S.J., and Tom Cornell. Full-page color advertisements for the military chaplaincy in Catholic publications have aroused ire in some—an emotion that pacifists shun, of course. I too was taken aback when I first saw in America magazine just such an ad. It was largely out of envy, another capital sin, because the Catholic Peace Fellowship cannot afford to advertise its full-time professional counseling. The C.P.F. receives 6 percent of all the calls made to the national GI Rights Hotline and takes calls at its own office in South Bend, Ind. Many of the calls come from members of the military and their families who are seeking counseling that, in better times and circumstances, they might expect from chaplains. Since its beginning in 1964, the Catholic Peace Fellowship has specialized in counseling. Jim Forest and I had to train ourselves in counseling techniques, in the law and in Selective Service rules and regulations, which we did with help from colleagues at the National Interreligious Service Board for Conscientious Objectors (now called the Center on Conscience & War) in Washington, D.C. At first we counseled Catholic conscientious objectors, then anyone who came to us from any background with any problem related to the draft, participation in war or military service. We had a very high success rate; clients received the Selective Service classification or discharge they sought. In 1980 we started training other counselors. For decades, I have been thinking about the military chaplaincy. Surely men and women in the military deserve and have a right to the ministry of the church in word and sacrament. In this respect Catholics in the military and their dependents currently are underserved. The Archdiocese for the Military Services reports that Catholics make up 40 percent of the Navy, Marines and Coast Guard and are served by 140 priest chaplains; 28 percent of the Air Force, served by 90 chaplains; and 25 percent of the Army, served by 105 chaplains. If dependents and family members of service personnel are counted, the figure approximates two million persons served by 335 priests. Members of the military are especially in need of pastoral care, young as most are and often married, with severe pressures on them in the best of times. These are among the worst of times, with multiple deployments to combat zones. We need more priest chaplains in military hospitals and in reserve and active units. Consider the rate of divorce and of suicide in the military (double that of only a few years ago) or among veterans of the Iraq-Afghanistan war. In its Annual Homeless Assessment Report to Congress in 2007, the U.S. Department of Housing and Urban Development estimated that 15 percent of the 671,888 sheltered and unsheltered homeless people in the United States are veterans. And the National Alliance to End Homelessness estimates that up to 467,877 veterans are “at risk of homelessness,” because their means lie below the poverty level and they pay more than 50 percent of their household income on rent alone. The physical, mental and moral damage done to our sons and daughters calls for everything the Christian community can offer in the way of prevention and relief. I remember hashing all this over more than once with the late Gordon Zahn, who proposed having the chaplaincy disestablished. He would have had priests minister to the troops, but as civilians, their formation and support coming from the church, not the state. That has been the case in the past in this country and elsewhere. Disestablishment would solve some problems, but it would give rise to others. It is hard to imagine that the church could afford to make the prospect of chaplaincy to the military as attractive as the federal government can. 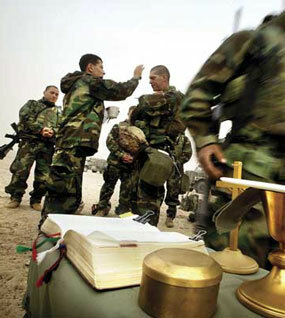 Moreover, priests must have the permission of their diocesan bishops or religious superiors to volunteer for the military chaplaincy and to leave their parish or other assignments. Many bishops and superiors think they cannot spare priests for even a single period of enlistment. Military service for some men and women becomes morally problematic when after recruitment they become aware of church teaching and of the realities in which they are immersed. They need moral guidance especially at this point in their lives. Catholics hear the definitive teaching of the Second Vatican Council: “Those who are pledged to the service of their country as members of its armed forces should regard themselves as agents of security and freedom on behalf of their people. As long as they fulfill their role properly, they are making a genuine contribution to the establishment of peace” (“The Church in the Modern World,” No. 79). They also hear the absolute condemnations of the use of weapons of mass destruction (No. 80) and the ratification, even the praise of the right to conscientious objection (Nos. 78 and 79). In view of that condemnation of the use of weapons of mass destruction and of The Challenge of Peace, the 1983 pastoral letter by the U.S. Catholic bishops, the Pentagon considered banning observant Catholics from postings to missile silos where nuclear-armed intercontinental ballistic missiles are kept ready for launch. Church authorities allayed their fears, however. American Catholics are “good citizens.” Contrary to international law and to Vatican II (No. 79), good Catholics can be relied upon to pass moral responsibility up the chain of command, or so they were advised. I am not making an argument here for absolute pacifism as national policy. Justice demands the protection of the innocent, even by lethal force if necessary. But it is difficult, as Pope Benedict XVI has stated, to imagine that a war might be just in these times, even though justice may require police action, as in Rwanda or Sudan, as a last resort. An army as a valid police force is not what we object to. But what of those recruits who are convinced that the war in Iraq is illegal, unjust and immoral? Early in the war, Archbishop Edwin F. O’Brien, then head of the Archdiocese for the Military Services, sent a pastoral letter to Catholic chaplains, advising them that they may calm the doubts of soldiers by telling them that their government leaders are privy to more information than is available to the public and that they may trust their leaders’ claims to justice for the cause. His letter did not endorse the war and did not question it either. It was very temperate. But any defender of the cause of any war at any time could utilize its reasoning. Not so with Bishop John Michael Botean of the Romanian Catholic Diocese in Canton, Ohio, who forbade his faithful to participate in the Iraq war under pain of mortal sin. Had other bishops or the U.S. Conference of Catholic Bishops itself followed suit, we might well have had a crisis of church-state relations on our hands. Might it not be time for that? The Web site of the military archdiocese offers a supportive commentary on the war in Iraq by Archbishop O’Brien from the time when he was the bishop in charge. But he would have come across different evidence and reached a different conclusion had his guides in Iraq not been U.S. military and political functionaries, but the unembedded journalists Ned Rosen, Dahr Jamail or Kathy Kelly, or had the archbishop visited the Christian Peacemaker Team in Kurdistan. What of those in basic training who come to a sudden realization that there is something fundamentally wrong with efforts to instill blood lust in them? That is the training method since the discovery after World War II and the Korean war that only a small minority of soldiers who had an opportunity to shoot at a fellow human being wearing an enemy uniform would in fact do so. This was because of the normal instinct of our species not to kill those of our own kind. Since then, the psychological science of “killogy” has revolutionized basic training to override that instinct. (Pardon the grotesque neologism; it is not mine, but Col. Dave Grossman’s, former professor of psychology at West Point and author of studies on how to desensitize people to the point of loss of scruple against homicide.) Troops in training are led to chant, “Kill! Kill!” Here is a cadence commonly used now: “What makes the grass grow? Blood makes the grass grow! Who makes the blood flow? We do! We do! Blood! Blood! Blood!” These are not theoretical considerations. I know personally a young woman of humble origin and a director of Catholic Charities in a major archdiocese who both concluded that there is something morally wrong with this kind of basic training. What of the young man or woman who knows instinctively that this attitude is wrong? What of the U.S. Army interrogator at Abu Ghraib in Iraq, Joshua Casteel, who had an awakening when a Muslim prisoner challenged his Christian faith? What is the chaplain’s proper role then? Are chaplains prepared to deal with men and women in a crisis of conscience that puts them outside the pale of the military? As pastors, I mean, not as military officers. Joshua’s chaplain was supportive, but many chaplains are not. Priests enlist in the military as chaplains with the best of intentions: to serve pastoral needs. But this is not why they are commissioned as officers or what they are paid for. According to their employers, the chaplaincy’s purpose is to contribute to the military success of the unit to which the chaplain is attached. This purpose may cause cognitive dissonance for some chaplains. It is not unreasonable to assume that many, however, will resolve their distress in favor of the presuppositions of the officer corps of which they are a part and into which they have been socialized. In 1968 then-bishop John J. O’Connor, who was chief of chaplains for the U.S. military, wrote a book called A Chaplain Looks at Vietnam, in which he defended the U.S. war policy there. He sent me, among others, an autographed copy and asked what I thought of it. Later he withdrew the book and apologized for it, calling it “a very poor book that I would like to re-write today, or hide.” He wrote it obviously influenced by the officers with whom he served in Vietnam, most of them before 1968, who were sanguine about the enterprise and its outcome. In this way O’Connor started a relationship with me and I dare say even a friendship. After some correspondence he assured me that all chaplains under his command were trained to know and understand the law and rules and regulations that apply to discharge from military service on grounds of conscience, and that Catholic chaplains were told to counsel conscientious objector claimants with the presumption of good will. I am sure Cardinal O’Connor meant what he said, but I am not sure he had the means to see whether the policy was actually in place. In fact, not long ago a highly regarded cadet at the U.S. Military Academy at West Point had to face his chaplain as an adversary during a hearing to judge his conscientious objector claim. At that hearing, when Bishop Thomas Gumbleton appeared for the claimant, the chaplain remained silent. The cadet was released without prejudice. He deserved his chaplain’s support but did not get it. Cardinal O’Connor had the right idea, or at least the right intention. The training of chaplains to support conscientious objectors never really took place, but if it had, much of the peace movement’s criticism of the military chaplaincy would be muted. We do not expect chaplains to trouble the consciences of their charges with the judgment of popes and episcopal conferences as to the justice of this or that war or of war in general. But we expect, even demand, that chaplains know the law and the rules and regulations pertaining to separation from military service by reason of conscience, and more critically, that they be instructed to counsel those who claim conscientious objection with a presumption of good intention. Anecdotal evidence has it that the opposite is often the case. Conscientious objector claimants are sometimes challenged, accused of bad faith and dismissed out of hand as cowards and malingerers. That amounts to a dereliction of duty on the part of priest counselors. Citizens, even soldiers, have the right to appeal to the law. And counselors have an obligation to assume good faith in the absence of factual contrary evidence. Good conscience and right conscience are two different things, but the distinction may be assumed; questions of fact and logic may be raised, but not the validity of a moral judgment made honestly. We in the peace movement will never be satisfied until the military chaplaincy is disestablished and priests and deacon chaplains are unambiguously servants of Christ and his church. Priests should not be forced to serve two masters. In about 30 A.D. the Roman Army had conquered much of the then known world. They were not nice guys, their methods of subjugation would make Abu Ghraib look like a Boy Scout camp. Nevertheless when a centurion, a leader of 100 Roman soldiers, reached out on behalf of his dying slave, Jesus acted and saved the slave. Luke says that Jesus was amazed at that centurion's faith. The Lord judged the individual soldier not the whole army. Similarly, Catholic chaplains who are in the same position as the troops are needed to help individual servicemembers who are struggling to serve both Caesar and God. Excellent excellent article. It needs to be read by all Christians of military recruitment age. The United States is the only country, as far as I know, that has attempted to incorporate Church-teaching in the event of war to limit the damage to combatants and minimize collateral damage by developing the so-called smart-bomb technology: low yield high accuracy weapons. Hence by definition they are not weapons of mass destruction. The are weapons of limited destruction: hit the target, take out the enemy. Even the neutron bomb which was ridiculed because of mindless and ideological press slogans sought to limit collateral damage in a nuclear conflict while engaging the enemy and minimizing nuclear contamination. I think the Deacon has to consider the nature of the enemy today and how to defend against that enemy. When you have rogue states as hosts to terrorists who are bent on attacking the United States; when you have rogue states supporting suicide bombers, and acquring weapons of mass destruction to assist Islamo-fascism you have a new type of warfare which must be defended against. Moral reasoning requires considering the circumstances in assessing the goodness or badness of an action. We cannot critique the conduct of warfare and the issue of defensive war today based on yesterday's circumstances. There may be moral dilemmas in a given situation but they shouldn't be contrived moral dilemmas based on inaccurate assessments,pacifist ideology or past methods of waging war. This is a new ball game. We have not been attacked since 9/11. This is not an accident. Show this enemy weakness (and this will be the danger with the incoming administration) and we invite attacks because we signal we are not willing to do what it takes to defend the Nation. In the defense of the Nation by and large our chaplains and military personnel can be proud. I believe Tom raises some good points here; Chaplains should be more supportive of believers who experience a crystallization of conscience. As a CO myself, I am very thankful for the support I received from my base chaplain, Col. Boone at Offutt AFB in 1995. His understanding of my decision and the reasons for it served to confirm the underlying principles of my convictions. The late Gordon Zahn rightly criticized what he termed "milleu Catholicism" by which he meant a Church that had become effectively 'Herodian'; accommodating the political currents of the day. Military force is the logical extension of political power. When the Church accepted this in the 4th century, it invariably set itself up for an unending serious of moral dilemmas. The Church implicitly accepted the same political power which had crucified Jesus of Nazareth. The Just-War Theory is an attempt to give theological justification for a phenomenon which the pre-Constantinian Christians (not to mention Jesus himself) never could have imagined or approved; a Church with the power of the State, with the power of the sword. ("Nothing is more foreign to us than State affairs" - Tertullian, Apology, 38). The fundamental problem with a chaplaincy is the witness it gives to the world; it gives the impression that military service is objectively compatible with Christian faith. According to the Catechism it is, of course, but I question whether the Catechism can be reconciled in this area with the earliest teaching on war. The early Church recognized that war wasn't and not just for reasons of potential Caesar worship - all the earliest evidence points to an ultimate reverence for the image of God in humanity and total prohibition of bloodshed. Paul criticized the Corinthians for suing each other in court; what would he say about Christians killing each other in defense of their respective nation-states? The wives of fallen soldiers in Germany and France understood this, hence the birth of Pax Christi. The body of Christ should not dismember itself through military service of Christians. To quote an article that I submitted to America which wasn't published: "The Baptismal oath (sacramentum) transcends, not terminates, all other relationships, loyalties and measures of justice." As a peacetime veteran in the Air Force I was generally interested in reading this artical. It would help to know what the criteria is to obtain the Conscience Objector status. I heard it before stated that, "one who could not defend the life of a family member when given the oppertunity to shoot the aggressor". While is is permissable for members of the Armed Forces to apply for CO status in America, or be transfered to humanitarian work in a military hospital, it is best to consult with the Chaplian to state what reason the person has to want to depart from there origial intention to defend the Constitution and Country. A more pressing need is the provision of chaplains to counsel the moral freeloaders who constitute the so-called "peace movement", Mr Cornell enjoys the privilege of living a carefree pastoral existence, and the freedom to condemn our armed forces and the chaplains who choose to serve their spiritual needs, precisely because he lives in a country which cherishes human freedom enough to fight for it when necessary. If Cornell had any integrity, he would move to a country where he would not be compelled to be the ungrateful beneficiary of the sacrifices of people that he holds in contempt. I was very happy to see your devoting space to THE CHAPLAIN CONTROVERSY. Those advertisements in America, Saint Anthony Messenger etc raised a number of questions for me; but as a former editor and publisher of a now defunct Catholic magazine I can understand the temptation of scoring a full page four color spread. Because I agreed with Tom Cornell I felt that his argument was especially cogent. I raised the issue of advertising with Steve Kelly S.J. last summer and in his recounting of the controversy of having a Jesuit on the faculty at West Point (to teach the Just War Theory) he recalled the words of someone on that topic: "The Just War Theory? I'm waiting until someone explains to me The Just Adultery Theory!" I was disturbed by Tom Cornell's statement that "the the peace movement will never be satisfied until the military chaplaincy is disestablished". His beleve that the ministry of the church can be provided to men and women in the military by some type of non-military group directly provided by the Church is not only impractible but next to impossible. It is also an insult to the many priest who serve the military with a fervent desire to serve the spiritual needs of these men and women. They do serve Christ and the church without restrictions from other "masters". May I also state that we are all in the peace movement.It is not restricted to specific groups. The vast majority of people in this world,no matter their religious or political beliefs, desire peace. It is not restricted to certain advocacy groups nor can its attainment always be simply defined. As we prepare for the arrival of the Prince of Peace let us pray that we may experience some semblance of peace in this world. Our Church: for macho warrior-and megalomaniac-Tailgunner Joe McCarthy and, yet, utterly and admanantly opposed to arbitrating for a decent wage for NYC gravediggers. And, yet, "In 1949, when gravediggers at Calvary Cemetery in Queens went on strike for a pay raise, the Cardinal accused them of being Communists and recruited seminarians from St. Joseph's Seminary as strikebreakers. He described the actions of the gravediggers, who belonged to the Food, Tobacco, Agricultural, and Allied Workers Union of America, as 'an unjustified and immoral strike against the innocent dead and their bereaved families, against their religion and human decency'. The strike was supported by such figures as Dorothy Day and Ernest Hemingway, who wrote a scathing letter to Spellman. Spellman defended Senator Joseph McCarthy's 1953 investigations of Communist subversives in the federal government, stating at an April 1954 breakfast attended by the Senator that McCarthy had "told us about the Communists and about Communist methods" and that he was "not only against communism—but ... against the methods of the Communists'." This article also appeared in print, under the headline "The Chaplain's Dilemma," in the November 17, 2008 issue.